Continue on to see a quick look at the 2017 team update in-game, including a preview of the roster and paint schemes. We’re very excited to announce the 2017 Team Update for NASCAR Heat Evolution. This update will be available on February 21 for $9.99 on the PlayStation Store, Xbox Marketplace, and Steam. New 2017 Paint Schemes: The #41 Monster Energy car and the #77 5 Hour Energy car make their NASCAR video game debut. After purchasing the 2017 Team Update, players will choose between the 2016 and 2017 season when starting NASCAR Heat Evolution. In 2017, players can choose between Race, Championship, and Career modes. The new 2017 paint schemes cannot be used online and they cannot be used in races with 2016 paint schemes. Due to the production timeline, the 2017 Team Update does not include the recently announced rule changes, Monster Energy NASCAR Cup Series branding, or any track changes such as the new Phoenix Start/Finish line. 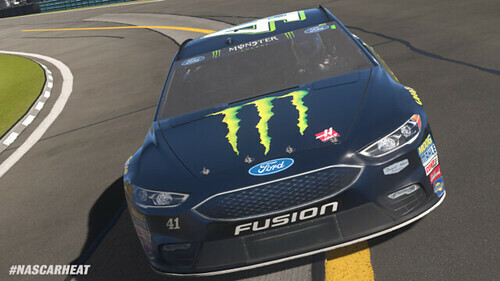 NASCAR Heat Evolution is excited to launch the 2017 Team Update and we look forward to the 2017 Monster Energy NASCAR Cup Series. See you at Daytona! Has anyone here bought or played this? I wouldn't mind adding a racing game to my collection and kill some time racing around the track, but I don't know anyone who has bought it, and it seems all comments and reviews of it around the Internet fall into either the love it or hate it categories. I've played it. It's good, but not great. In a nutshell, the racing is OK but the game is lacking in features. It sorely needs some sort of online league. On launch day (late afternoon IIRC) there were only a handful of people online, mostly in private servers I believe. They have been good at adding DLC (paint schemes and additional spotters) with some premium and some free. I didn't play enough of the career mode to weigh in on it and found the challenges more difficult than I thought they should be. If you get it for $20 or so, I'd recommend it but not more than that. Not a bad game, but just needs more. Thanks! I did some searching last night, while nothing official from the company, apparently the lead guy on the game has answered questions on Twitter recently and essentially said there would be a NASCAR Heat Evolution 2 announced in June and coming out this September. So unless this goes in sale in the next month or two for $9.99 or something, I may just wait it out and see what the reviews of the supposed new game in September gets, see if they improved on the various complaints I've seen people making about this first game. While I'm not really a NASCAR fan (the real NASCAR) I do like the racing games. I think NASCAR 2001 was one of my first PS2 games when I got that system, and I enjoyed myself back then. It can be fun running semi real length races (150+ lap lengths) and trying to strategize on pit stops and trying to move up the pack over the course of the race.